While it may seem harmless and even endearing to true cat lovers, cats on your counter top is actually kind of gross. Think of the other surfaces those tiny paws have touched--i.e. the liter box--right before pouncing their way to your dinner plate. Appetite: lost. But fear not, there are ways to keep kitty off your counters and unwanted particles off your food. Let's start out with an excellent quote from the ASPCA: Rather than spraying your cat with water when they jump on a forbidden counter, "arrange for the environment to punish your cat directly." "Balance some lightweight cookie sheets on the edge of the counter. When your cat jumps up, she'll land on the sheets. They'll move and possibly topple over, making some unpleasant noise while she leaps back onto the floor." If you don't want your cats on your cookie sheets and your cookie sheets on the floor (or if you only own one cookie sheet), Huffington Post recommends using cheap, recyclable aluminum foil. The Humane Society advises making your counters unpleasantly sticky, either DIY-style using double-sided tape, or using readymade products. This Old House notes that cats hate the feel of sandpaper underfoot, so you could lay it on your counters when you're not cooking. 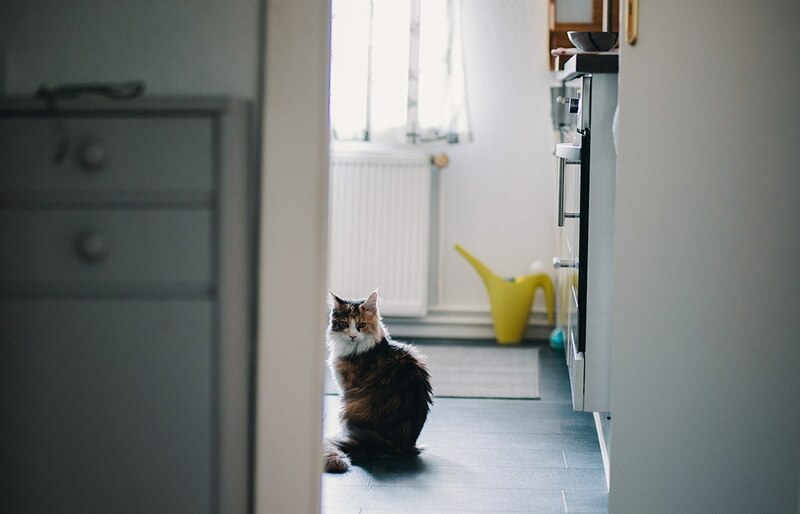 If your counters are your cat's idea of a little piece of heaven, Petfinder recommends simple ways to make them less enjoyable, like pulling down the blinds to block the basking sun — and the view of the bird feeder. According to The Nest's Pet column, a peppermint solution can be sprayed on countertops to deter cats — and to make your kitchen minty fresh. WikiHow has similar advice involving black pepper, lemon, eucalyptus, cinnamon, rosemary, and lavender — delicious. One of my favorite solutions comes from Pawnation: "Some experts recommend clicker training. This method involves training your cat to jump off the counter on a cue word, like 'off'. When the cat follows your cue, click the clicker, then reward your cat with a treat." Positive reinforcement!